Maintaining a clean living environment is great both for your health and happiness. However, it takes time. And busy lifestyles make finding the required time and motivation hard. That is where our teams come in. Our company provides reputable domestic cleaning in London. With us, you can forget the worries, hassles and downsides of doing the cleaning yourself. Instead, we urge you to sit back, relax and enjoy your time off work. Simply let our professionals do on theirs. Some people view resorting to domestic cleaning in London as a downfall. But while the task itself can be fun with the proper mindset, there is simply no point to devote your free time to it, when you have access to top-of-the-line experts at domestic cleaning in London. Extend the lifespan of your home and furniture – Proper cleaning techniques help you preserve your property longer. Flooring, upholstery, furniture and windows all require specific approaches. Our London domestic cleaner experts have spent lots of time and effort in perfecting the necessary techniques, allowing them to take proper care of your home. The better you treat your furniture, the longer you will get to enjoy it. First Choice Cleaning Company London offers excellent services at an affordable price. Some companies prefer to provide domestic cleaning in London at a very high price. This is always a tricky question – too high a price turns people off because it seems unreasonable. Set too low a price and you risk being viewed as a company that does not care about what they do. We provide domestic cleaning in London at an average price. It allows us to both keep customers interested AND keep our team engaged with competitive compensations. Choosing us to do the domestic cleaning for you ensures that you and your home receive a professional treatment. Simply sit back, relax and before you know it, your home will look better than ever. Impress your friends, guests and neighbours with the help of our exceptional domestic cleaning services for London residents. Never worry about privacy or personal matters – Discretion is a mark of professionalism. It is one of the main things that has made us one of the most reliable and sought-after providers of domestic cleaning in London. Our teams will never get involved in your business or look through places they are not meant to access. And even if they do encounter something out of place, they will never discuss it with others. We have very strict policies when it comes to domestic cleaning in London, and our entire team firmly stands by them. Should you find yourself in need of more information, do not hesitate to contact us. Our expert customer support will provide answers to all of your questions. If you have more advanced queries in mind or would like to arrange a meeting with one of our representatives, we are here for you. You can get in touch by email or via phone at 020 3819 5735. 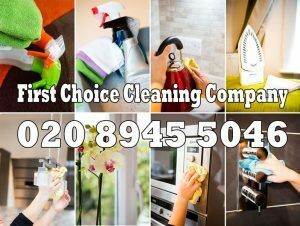 © Copyright 2012 - 2019 First Choice Cleaning Company - All Rights Reserved. XML. KML.